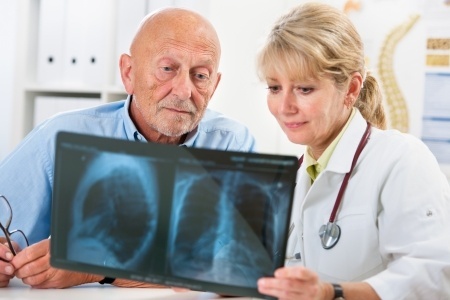 Is There Space for Second-Line Treatment of Pleural Harmful Mesothelioma? Harmful pleural mesothelioma (MPM) is described by a terrible guess and humble action of foundational treatment. Presently, there is no certain concurrence on the clinical part of second-line chemotherapy in patients with MPM; all things considered, early contextual investigation reports including some pretreated patients had given confirmation that extra reactions are conceivable with the utilization of further chemotherapy1 after the disappointment of first-line treatment. Lamentably, the proof supporting the viability of second-line treatment in this setting is all around powerless. A randomized stage 3 trial, selecting 243 patients, thought about pemetrexed in addition to best steady care versus best strong care alone in patients already treated with a first-line regimen excluding pemetrexed. At the point when this examination was distributed, be that as it may, the utilization of pemetrexed in blend with cisplatin had been as of now acknowledged as standard first-line treatment. The examination demonstrated a factually noteworthy increment in target reaction rate, infection control rate, and time to movement for pemetrexed, however without huge advantage in general survival.2 Whether the advantage in flip side focuses, without contrast in survival, could be viewed as adequate to prescribe second-line pemetrexed for clinical practice is easily proven wrong. Regardless, the trial enrolled patients who were pemetrexed guileless, which extraordinarily lessens the present relevance of these outcomes, with pemetrexed being a piece of first-line treatment in the lion's share of patients now. Would we be able to consider the outside legitimacy of these outcomes helpful for clinical practice? Most likely not. Notwithstanding when we consider the move from pemetrexed to other chemotherapy drugs, as vinorelbine, their utilization as second-line treatment depends on little, nonrandomized arrangement. Following past involvement in the principal line setting,3 week by week vinorelbine was tried inside a solitary focus stage 2 open-name consider in 63 patients with past introduction to chemotherapy. Like all the single-arm trials, the outcomes acquired in this arrangement of patients are at solid danger of being molded by determination inclination: middle interim between the finish of the principal line chemotherapy and the begin of the week by week second-line vinorelbine was a half year, most patients had a decent execution status, all were named generally safe as indicated by the European Association for Exploration and Treatment of Growth prognostic score, and middle age of this very chose populace was 59 years. An aggregate of 10 halfway reactions (16%) were watched, and a further 43 patients (68%) had stable ailment characterized as no proof of movement for a half year. Middle general survival was 9.6 months. Be that as it may, would we be able to confide in the reproducibility of these outcomes in unselected patients, with a shorter without treatment interim, more established age, and more terrible execution status? Presumably not. Essentially, rechallenge with platinum-pemetrexed chemotherapy is at times considered in patients who have acquired a long movement free interim, however the proof supporting this procedure is again powerless. This system is likely more upheld by the similarity with the rechallenge in other strong tumors where platinum-based treatment is utilized, as opposed to by information particularly delivered in patients with MPM. In this particular setting, the rechallenge has been investigated by Ceresoli et al,4 portraying the result of patients who had gotten drawn out movement free survival (PFS) (more noteworthy than 3 months) with the past first-line treatment. Thirty-one patients were incorporated into the examination, yet there was heterogeneity in the treatment embraced: 15 patients had a rechallenge with single-specialist pemetrexed alone, while 16 had a genuine rechallenge with the two medications. One patient encountered an entire reaction, though a halfway reaction was accomplished in 5 patients, delivering a humble general target reaction rate of 19%, and a general illness control rate of 48%. Is this confirmation adequate to consider rechallenge with pemetrexed-based chemotherapy as a moment line treatment alternative in patients with MPM? Most likely not. Considering this nonappearance of hearty proof supporting the utilization of second-line treatment in clinical practice, what is the position of existing rules? National Extensive Growth System (NCCN) Clinical Practice Rules appear to help the utilization of second-line treatment. Indeed, despite the fact that indicating that restricted information are accessible to direct the decision, NCCN rules express that "second-line chemotherapy choices incorporate pemetrexed (if not managed as first-line treatment), vinorelbine, or gemcitabine, and information propose that rechallenging with pemetrexed is compelling if patients had a decent reaction to first-line pemetrexed. "5 Moving from the Unified States to Europe, momentum rules of the European Culture of Therapeutic Oncology, distributed in 2015, express that, given the nonattendance of standard second-line or further-line treatment, it is suggested that patients who are in great clinical condition at illness movement after first-line treatment ought to be enlisted into clinical trials.6 There is no unequivocal proposal for patients outside the chance of clinical trials, in spite of the fact that the announcement that "solitary operator vinorelbine has demonstrated valuable action in stage II trials" infers that, in spite of the fact that not standard, second-line treatment can be considered in clinical practice. Italian specialists partaking in the Third Italian Agreement Gathering for MPM expressed that, in patients advancing after a first-line pemetrexed-based regimen, there is no standard second-line treatment, and patients ought to be urged to take an interest in clinical trials.7 In any case, the following proposal in a similar report stresses that, outside clinical trials, single-operator chemotherapy could be a conceivable alternative for vindication, in spite of the fact that the board was not consistent about this suggestion. What should we do in clinical practice? Obviously, patients ought to be satisfactorily educated to add to the choice. Offering the data to them transparently and clarifying that even best strong care, without facilitate dynamic treatment, would be a worthy treatment alternative ought to be an absolute necessity do. Patients ought to be urged to take an interest in trials, yet clinical trials ought to be better planned. There is an enormous assortment of progressing trials right now. The oncologic group ought to be firm and clear on what we need from an interventional trial directed in the second-line setting. To start with, trials ought to be randomized. We recognize that observational or review contemplates are useful to deliver theory creating proof, yet in this setting, as in the larger part of clinical settings, they will never show signs of change rehearse. Moreover, given the heterogeneity in anticipation and the trouble of translating a solitary arm understanding without a comparator arm, we trust that a control arm is expected to effectively decipher the result of patients treated with the exploratory medication. For example, in the event that we consider the randomized stage 2 trial testing the expansion of bevacizumab to cisplatin and gemcitabine as first-line treatment of patients with MPM, the trial treatment delivered a middle movement free survival of 6.9 months and a middle general survival of 15.6 months.8 These outcomes, if created inside a solitary arm trial, would have been most likely judged as promising. Tragically, the result of patients doled out to the control arm of a similar trial was superimposable, with no critical contrast between the gatherings. Most likely, the same would occur in the second-line setting, considering that the heterogeneity in guess and the danger of choice predisposition can be significantly higher than in patients qualified for first-line treatment. Given the nonattendance of medicines of demonstrated viability, fake treatment is satisfactory for patients appointed to the control arm, despite the fact that we comprehend that the nearness of an arm without dynamic treatment can diminish the agreeableness of the trial. Patients selected in the trials ought to be all around adjusted by existing prognostic scores. Especially, patients ought to be stratified in light of the span of sickness control acquired with first-line chemotherapy. This is a prognostic factor, however could be additionally a captivating prescient marker for second-line chemotherapy, speaking to what is routinely called "platinum affectability." Patients with MPM who had reacted to platinum-based chemotherapy and have a PFS more noteworthy than a half year may have a more responsive growth, while patients with short PFS have rather forceful mesothelioma, impossible receptive to assist treatment. For example, there are trials investigating immunotherapy in this setting, either in set up or enrolling right now, for example, the Affirm trial (pembrolizumab, clinicaltrials.gov identifier NCT02083484) and the BIB296 (tremelimumab and durvalumab, clinicaltrials.gov identifier NCT02588131). To the extent we know, neither of them has a PFS stratification like the one we have proposed. It ought to be viewed as that a lopsidedness in collection between the treatment arms will have a conceivably negative effect on the last trial comes about. All in all, we feel that, right now, the genuine advantage related with the organization of further dynamic treatment to patients with MPM whose first-line treatment has fizzled is unverifiable, best case scenario. Obviously, this ought not suggest an agnostic vision. Despite what might be expected, clinical research is crucial to get advance in this setting, and all around composed clinical trials are emphatically required.